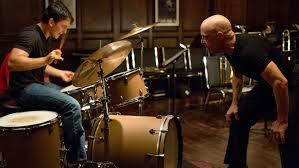 And now we come to one of the most hyped up films of the year, Damien Chazelle’s Whiplash. The critical response to this film has been insane. Heck, half of the poster AND the trailer is just praise for the film. But, does it really deserve it? For my money, it is a very good film, mainly due to the questions that it asks. How hard should you push yourself to succeed? Is the main character doing whatever it takes to achieve his goal, or hurting himself for something that isn’t worth it? In the end, there are no clear answers, but maybe just bringing these questions up is enough. It’s entirely possible that one person seeing the film could draw an entirely different analysis than another. The techs are very good here. The editing here is marvelous. The pacing, and at every moment the decision of whether or not to cut is always made correctly. I hope this gets nominated. Likewise, the sound design, particularly in the final scene is extremely well integrated into the film. Acting-wise, J.K. Simmons is truly great in this role, although really, this is one of those roles that a lot of people could probably do very well in. Nevertheless, he is impeccable. And Miles Teller is pretty impressive, too. This is one of those movies that really makes you think, and for that alone, it’s worth seeing. The direction, writing, editing, all very good. In fact, It’s hard to think of anything really wrong with the film at all. However, despite all of this, I am not going to give Whiplash 5 stars.